Equity Crowdfunding is becoming one of the hottest trends in investing and could be ready to explode higher! Just one year after passage of Title II of the JOBS Act, a total of 534 companies successfully met their crowdfunding goal for equity participation. More than $200 million in equity capital was raised, averaging a little over $400k per company. The industry is developing quickly and crowdfunding platforms for equity investing are popping up everywhere. The crowdfunding revolution is happening across all 50 states, the District of Colombia and Puerto Rico. Even in states where equity crowdfunding just opened up to regular investors, intrastate crowdfunding has been developing as an alternative for small business funding and crowdfunding investing. In a world of private equity and startup investing where average annual returns top 24%, the potential to put your money to work has never been higher! Among crowdfunding sites, you have those focused exclusively on donation-based funding and those crowdfunding platforms for equity investing that offer an ownership right to the company. After years of waiting on rules from the Securities & Exchange Commission to allow regular investors the opportunity to invest in equity crowdfunding projects, the government finally enacted Regulation A+ and Crowdfunding Investing Title III over the last few years. We’ve yet to see many equity crowdfunding platforms take advantage of the new rules to bring in regular investors but that could change very soon. So just how big could crowdfunding for businesses get? The chart below, from census data, presents U.S. households by income in 2013. Even if we assume a market of households with $50,000 annual income and above, allowing regular investors into equity crowdfunding investing will increase the market’s size by more than ten-fold. What's waiting for crowdfunding in 2018 and where should you put your money to get the highest returns? How big could equity crowdfunding investing get? The U.S. market for angel investing and startup financing reached nearly $50 billion in 2012. On top of this, lenders granted 20.3 million small business loans worth $159.3 billion bringing the total to nearly $210 billion from just three avenues of small business funding. With the passage of Regulation A+ and equity crowdfunding investing through Title III, the potential pool of investors to equity crowdfunding could grow more than ten-fold. If just 10% of small business funding goes through crowdfunding, the market would total $21 billion. The number of crowdfunding platforms for equity investing, and similar sites that offer different models of investment, seem to increase by the day but a few stand out with some institutional knowledge and a strong platform. Success in crowdfunding and investing will depend on the market's knowledge of the resources. One of the biggest beneficiaries to the crowdfunding boom has been real estate investing. Real estate crowdfunding platforms have benefited from the lack of lending by traditional banks and investors that need higher returns. Returns on equity crowdfunding are likely to mirror those in angel investing and venture capital, older forms of private investing that have been open to wealthy investors for decades. I spent most of my professional career as an equity analyst for venture capital so I’ve been waiting for the chance to take this early-stage investing to main street investors. Not sure how crowdfunding returns can boost your retirement income? Use these investing calculators to estimate your retirement income and financial goals to boost your nest egg. 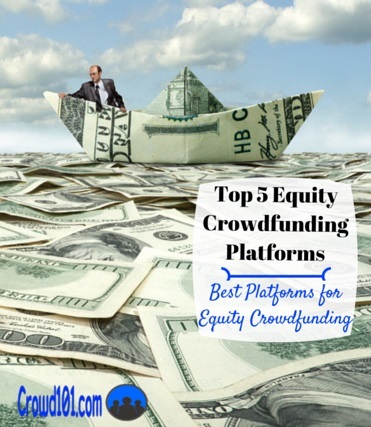 Here's my top picks for equity crowdfunding platforms for investment. 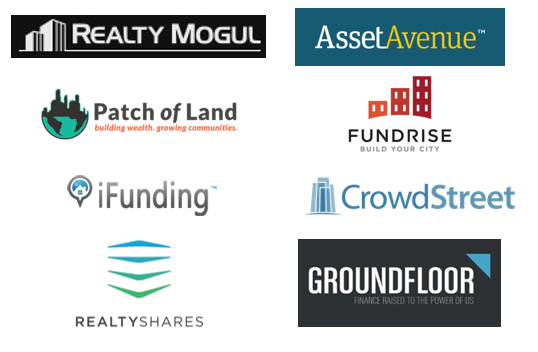 RealtyShares is my favorite equity crowdfunding portal for real estate crowdfunding. The real estate portal has funded more than $200 million in properties which have returned 10.75% annually, easily beating the return on the S&P 500. What I like about real estate crowdfunding is that, unlike investing in REITs where you only get an ownership in the fund, you get direct ownership in the properties. RealtyShares underwrites investments through a strict process and only about 5% of submitted deals are approved so a lot of the analysis work and due diligence is done for you. After an application is submitted, deals are screened for the management team, their track record and finances. The property project is then analyzed on a set of due diligence checks including financial, legal and location. Investors pay a max fee of 2% on their account and get instant diversification by investing in different property types across the country. Returns are distributed on a monthly or quarterly schedule depending on the property. Click for more information about investing on RealtyShares. EquityMultiple is a newer real estate platform but one that is getting some very good deals. The site targets only institutional-quality commercial properties instead of individual developer deals. That means projects are often also backed by big money institutional players that can help make the deal a success. I mostly invest on Realtyshares and Peerstreet but have accounts on other real estate crowdfunding sites to get access to the most deals possible. It costs nothing to open an account on an equity crowdfunding platform and you usually don’t even need to deposit any money. Once you’re ready to invest in a deal, you can deposit money quickly to put it to work. The site reports 75,811 investors and 15,805 companies for $130.5 million in investments. The average size of equity projects is $1.6 million, mostly through seed funding and initial rounds of financing. The company has been operating in the U.K. for quite some time and has a good archive of articles and media from which to learn. Crowdfunder is probably the largest and most established crowdfunding platform for equity investing. Crowdfunder is an all-or-nothing platform and campaigns are recommended to set multiple rounds of financing. This increases the likelihood that you will get funded through earlier rounds with smaller amounts but it also increases the risk to investors. Companies looking for seed funding or proof-of-concept may still be years and multiple financing rounds away from any sales or profits. Campaigns are able to set their own deadline up to the 60-day maximum. A monthly fee starting at $299 is charged on all projects. Crowdfunder charges a 5% fee on successfully funded campaigns. Payments are only offered through Amazon Payments which charges a 2.9% fee and a $0.30 transaction fee. One of the new crowdfunding sites dedicated to real estate investment, Realtymogul reports more than $39 million investments across 98 properties since its launch in 2013. Realtymogul is not necessarily one of the crowdfunding platforms for equity investing but a crowd platform for real estate investing. Crowdfunding real estate projects carry different levels of risk and return than start-up investing. Returns are not likely to be as high but cash flow will likely be sooner and more regular than with start-up financing. 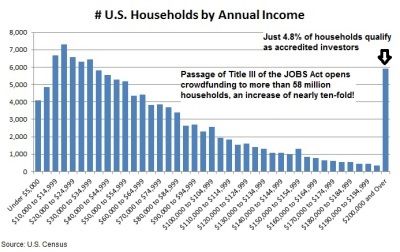 As with equity crowdfunding, only accredited investors are allowed to invest until final passage of the JOBS Act. The site provides a breakdown of property types for funded projects with residential and retail commercial properties accounting for a large proportion of the total. The site also allows projects to raise debt financing through loans. Fundrise is another real estate investing platform that reports 34,152 members and 12% to 14% average return based on the projected gross returns for each funded offering on the site. Minimum investments start as low as $100 per project and less than 5% of offering solicitations from real estate developers are approved by the site. The lock-up period for investments appears to be shorter with the site claiming a 1 – 5 year lockup on most investments. Unlike Realtymogul, Fundrise offers direct public offerings to investors which means you are investing directly in the real estate project. Since it is a direct offering, Fundrise has to go through a lengthy SEC application process for each project so that may slow the number of offers available. I interviewed the co-founder of Fundrise about a really interesting feature on the site, Guaranteed Funding for Real Estate Crowdfunding campaigns. The site touts more than 11,000 accredited investors and $22 million invested over 100 companies. After a company submits an application for review, a committee reviews the application for growth metrics and viability. A panel of investor members, composed of angel investors and entrepreneurs, then reviews the documents in a vetting process. Projects are launched in ‘watchlist’ mode before investing can take place to allow potential investors to perform their own due diligence. The minimum investment is $3,000 and fewer than 3% of reviewed companies are selected to go up on the site. Fundersclub recently celebrated its two-year anniversary and disclosed a 47.9% unrealized net IRR over the period. It may be a little early to get too excited since the return is unrealized and most venture funding needs at least three to five years to exit and provide a return. The statistic is compelling though and it appears the site offers investors a good opportunity to piggy-back on deals vetted by other players. EquityNet has helped 20,000 investors fund more than $250 million to nearly 30,000 companies since its launch in 2005. EquityNet owns several patents for its crowdfunding technology, including one for analyzing enterprise risk and one for its marketplace solution. The strong intellectual property could help the site grow rapidly as the JOBS Act is implemented. EquityNet seems to go a little farther than others in helping business owners develop their plan. The site offers business planning software that is pretty detailed and user-friendly. The software also helps owners develop professional reports and graphics to communicate with investors. For investors, EquityNet offers a different model from other sites. Investors are able to contact entrepreneurs directly and invest directly in the projects off-line. How Do I Invest in Equity Crowdfunding? One of the biggest differences in equity crowd platforms is the type of investors that can participate. For most websites, any investor can take part in deals but there are still some that require accredited investor status. An ‘accredited investor’ is someone that has over $1 million in net worth, not including your home, or makes around $200,000 a year. This is a requirement by the government regulatory agency. Supposedly, someone with a lot of money makes better investing decisions…I don’t buy it. Most equity investing sites that only allow accredited investors go on investor self-reporting, meaning your income or qualification isn’t verified by the website. If you qualify, getting started on an equity crowdfunding site is easy. What are Equity Crowdfunding Returns for Investors? There is a difference in equity crowdfunding returns for real estate investors versus those investing in startup companies. I’ve invested in both forms of crowdfunding as well as in the traditional methods outside of the crowd. Real estate crowdfunding returns range from 9% on debt investments to an average of 14% on equity investments. Debt investments pay off on a quarterly basis and usually last for up to three years. Equity investments pay off when the project is sold or refinanced and usually last for up to five years. I’ve always loved real estate investing and have about 10% of my total wealth in crowdfunding projects. For higher returns, equity crowdfunding in startup companies is where it’s at. Equity crowdfunding returns can easily reach into 1,000% and higher. It’s no different than the traditional way of investing in new companies before they issue public shares. The fact is that most startups fail and will return nothing. About half of my equity crowdfunded companies have gone bust while another 20% have returned my investment but not much more. It’s the remaining equity investments that make it all worth it. Those remaining 30% of my investments, maybe three startups in ten, account for the majority of returns. Through 2017 and a few dozen equity crowdfunding investments, I’ve averaged a return of 31% annually. Equity crowdfunding isn’t for everyone but I would highly recommend considering it as a part of your portfolio. We’re not talking a big chunk of your money. I would invest no more than 20% in these alternative assets but that can be enough to boost your overall portfolio return well into the double-digits. There are two main considerations though when investing on an equity crowdfunding site, liquidity and failure rate. Liquidity is just the idea that your money is locked up for several years. Investing in either a startup company or a real estate project means you won’t have access to that money until you get a payout. For startups, that’s usually between three and seven years. The time lockup on real estate crowdfunding is shorter, usually between one- and five-years. Failure rate is a big problem for a lot of investors, especially in equity crowdfunding. You won’t see it as much in real estate crowdfunding because the projects are less risky and backed by physical property. In equity crowdfunding, you’ll see up to half of your investments bust. That can be hard to stomach for a lot of investors but you have to look at it from the entire portfolio. Hold ten or more equity investments and your returns are going to average out. Even if half of your investments bust, those few that are successful will take your average returns to 20% or more. It still feels a little like the old west for equity crowdfunding and the crowdfunding platforms, even for accredited investors with experience in start-up financing. The years ahead are bound to bring changes in regulation, how companies communicate with investors and how platforms connect the two. Just like the old west, it will be the early settlers that make the most money, getting in on the best deals and finding the best equity crowdfunding platforms for investment. Thank you for the list provided here There is absolutely no doubt that the equity crowdfunding is really one of the most effective ways to raise the capital now a days.This list should prove to be pretty helpful in this direction. Hello, I am in the process of raising series “B” investments via EquitytNet. My partner and I along with our lawyer have decided that Title II is best suited for our monetary needs. We are aware of the 506(D) forms and per-State reporting that is required under this rule. We are looking to raise $2MM which we believe will take our company through breakeven and the end of dilution. The thing that isn’t spelled out in any sites and is almost impossible (without a spare week) to parse out of the SEC documents is: “Testing the waters”. I understand this part in the context of the Title IV (A+) regulations but I’m talking about a classical “test the waters” with any offering. Let me cut to the chase: Can a company going down any of the other 4 Crowdfunding methodologies virtually “test the waters” by the act of placing your company’s product and financial information, its business plan and its offering documents and then wait for a communique that goes all the way through an investor saying (perhaps not writing) that they wish to invest? In Short, are all the legal preclusions laid out in these laws not in any effect until signatures and monies are exchanged? If No, then is there a truncated method to see the response on the company and its product. Thanks for the question Charles. All the crowdfunding regulations are effective on posting the campaign since it is so hard to determine or limit who in the public will be a able to see the campaign. When someone comes to you to invest, you must qualify them as accredited or regular investor. There’s a lot of legal requirements and you really do need a crowdfunding or securities lawyer to handle the filings. I usually recommend testing the waters with a rewards based crowd campaign first if possible. Hi Joseph, Thanks fro your work on this. Any suggestions on equity crowdfunding for non profits? We have a strong nonprofit looking to buy a building and also fund scientific research. BTW we are launching a new website this month. Good question Blake but I’m not sure equity crowdfunding would even be possible for a non-profit. The idea of equity participation is to have a share in the profits of the company. Non-profits would need to raise money through either a charitable crowd campaign or a rewards-based campaign.